Classic South Chatham Family Beach Retreat! There is room for everyone in the livingroom. A view of the living room & dining area from the other side. The kitchen is big enough for the Chef and some assistants! The deck has both sun and shade. 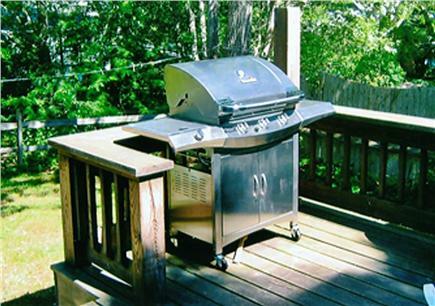 The 14 x 14 deck has a small ocean view and a full gas grill. A big Weber grill feeds the army. 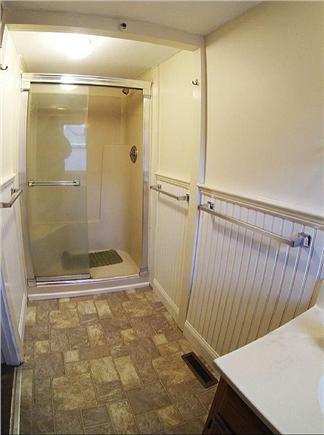 The outdoor shower is reason enough to choose this cottage! Lots of beach and lots of jetties. Company or solitude! From the air.... You are here! This is our three generation family cottage. First built as a tiny four room box in the early Fifties, it has been remodeled several times. We call it ''Nipantucket'' for its many facelifts! Three bedrooms, one bath cottage, two story, large deck, outdoor shower, BBQ grill, cable TV, and WIFI. Newest updates include a flat screen TV and a compact washer/dryer! Location-location-location! The beach is right there! 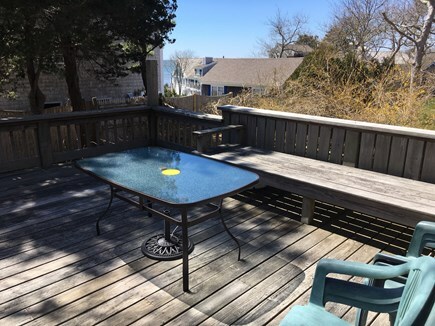 The property is a two story house on a quiet side street in a neighborhood on Nantucket Sound. Nearby, in the main Village of Chatham (6 miles) is some of the finest upscale shopping on Cape Cod. Chatham is a beautiful New England village that has resisted the garish commercialism that affects many seaside tourism areas. Dozens of fine restaurants and family style restaurants are within a twelve mile radius. Fishing, windsurfing, kite boarding, kayaking, clamming, birdwatching and general beachbumming can fill your days. On the nearby (1 mile) bike path, one can pedal 30+ miles from Dennis to Wellfleet. Day trips to Provincetown, whale watching, a water fun park in Wareham, dozens of golf courses and miniature golf courses provide family fun. Cape Cod has it all, and this cottage can be your family home base! Additional pricing info: There is a fully refundable $300 damage/excessive cleaning deposit. State and local taxes of 12.45% will apply. A wonderful vacation spot, walking distance to the beach, shaded streets for relaxed walking or biking. The house was perfectly set up, the kitchen was fully equipped, we had everything we needed and more. The back deck is amazing, the gas grill is top notch, and the patio set makes it a great spot for outdoor eating. The beach was so close, we loved it and spent a lot of time there! The outdoor shower was wonderful, it was great for getting the sand off the kids and the toys, and we all really enjoyed the outside shower. Thanks for your kind words! We are glad you had so much fun and that you liked our special place! It's a wonderful beach life! !! Excellent. Literally less than a minute walk to the beautiful beach. Highly recommend to everyone. House is beautiful and has everything you need and then some. Could live in the outdoor shower. Came here the 1st time in 1969. My parents brought us every year after for our summer vacation and it is the perfect spot for families. We rode our bikes all over and spent hours on the beach, a very short walk away. My husband and I spent our honeymoon here and we brought our children for vacations. It is located only a short way from a great bike trail. We love the Cape and especially the cabin! 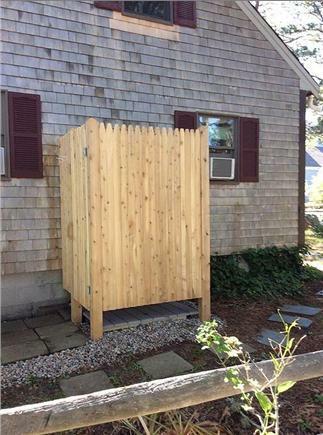 My sister in law thinks the large deck out back is the best attribute, but I also like the outdoor shower. The inside is cozy and has everything needed for a great vacation. The bedrooms have plenty of room and the beds are very comfy. My Mom and I love to shop both the malls and the thrift stores and have hit them all! Every year we spend at least one day in Chatham shopping. My husband and brother love to fish, so they bring their float tubes and hit the multitude of ponds for perch and bass. We always take one day and go to P-Town for a Whale Watch, people watching and shopping. The Cape Playhouse is a must. We have seen wonderful productions over the years and are looking forward to seeing a musical this summer. We have gone on a few fishing charters and would recommend one of the ones out of Chatham Bay as the best and closest. Don't miss the Music Stroll that's held every other Wednesday all summer long in Harwich Port. It's free and there's music for everyone. 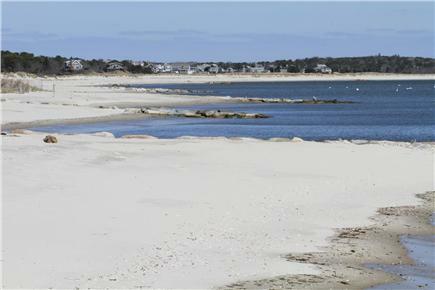 Beaches are wonderful on the Cape. If you don't mind a little seaweed the beach near the cabin is great, but Chatham Lighthouse Beach is nice and there are certain days that they let you go up the lighthouse. It's not that far to get to the National Seashore and their museum is fun to go through! Sunday after brunch at Brax Landing (great food) we always head up the Wellfleet to the flee market located at the drive-in. We have to go to the Weatherdeck for a lobster roll and our annual mini golf match even now that we don't have kids around. Have had great experiences at Captain Frosty's on Rte 6 and Lands Ho in Orleans, but usually we just grill on the back deck and spend our evenings playing cards and games. I would recommend this property to anyone and everyone. Have so many great memories and am looking forward to many more here!